Well, my beloved Red Sox are World Series Champs! I can’t think of a better way for the season to finish. I’ve always found it interesting that of the 10 teams that make the playoffs in Major League baseball each year – the 10 best teams – only one of them wins their final game of the season. 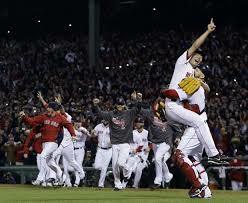 This year, is was Beantown’s Bearded Brotherhood – the Red Sox, winning for the third time in the past 10 years. I have been blogging about Christian Athletes for three and a half years now. Over that time, I have read and learned the stories of nearly 200 athletes and how they are using their stories and their platforms to share their faith in God with others. I have learned lessons from their stories that apply to my life, and, I believe, the lives of all Christ-followers. I have decided to take some of those posts, expand them and put them together in a book. The result is my new book Living Beyond the Game. This book will feature the faith stories of 15 Major League baseball players, including Jarrod Saltalamacchia, Daniel Nava and Jake Peavy of the World Series Champs. I will be offering hard copies of the book, which will be available the first week in December. If you pre-order your book in November, you can get it for the introductory price of $14.99. After December 1st, the price will be $17.99. Order your copy here. Thanks, and keep stopping by to find new stories about Christ-followers in sports.